FISHBALL STORY is a hawker stall specializing on hand-made fish ball (with no flour) by 23-year old Douglas Ng using his grand mother’s heirloom fish ball recipe. He is the recipient of the overall tastiest feast in the 2015 Chowzter Asia awards. You got to try this on your next food trip in Singapore! MARINA MANDARIN is a five star luxury hotel in Singapore with an impressive view of Marina Bay. It’s an ideal location when watching shows in Esplanade, attending conventions at Suntec, or hearing the roars of the F1 cars during the Singapore Grand Prix Formula One race. You’ve got to check out this secret hawker canteen on your next trip to the Lion City! Singapore’s Gardens by the Bay is an award-winning urban landscaped garden featuring two cooled conservatories and the Super Tree Grove. SENTOSA SINGAPORE: 2014 Guide to an Awesome Sentosa Experience with DAY FUN PASS! The first time I was planning my Sentosa Trip with the boys in 2013, I had a hard time because I was not familiar with the attractions and their proximity to one another. Sentosa is huge and it could be daunting just looking at the map, planning your itinerary and budgeting the trip for the family. I was planning to buy the Sentosa Day FUN Pass with a promise of getting access to 20 attractions with a caveat that you have to finish all of them in one day. I wonder if it was even feasible to hop from one attraction to another and enjoy it instead of just ticking them off a list. After several visits to Sentosa, I would like to share with you how to maximize the BEST of Sentosa attractions with an effective 1-day itinerary at the most efficient cost. READ: SENTOSA: 2014 Planning Guide to Maximizing the Sentosa DAY FUN PASS! With the use of Augmented Reality, Singapore Cable Car launched Asia’s first-ever DC Comics Super Heroes-inspired cable car experience. Ride with Superman, Batman, Wonder Woman, and Green Lantern to fight against evil and save the day. Afterwards, you can eat at the new casual dining spot–Spuds & Aprons (which replaced the premium Jewel Box brand)–with a stunning vista of the relaxing greenery, a running cable car line, and an aerial view of the harbour. Situated just 15 minutes from Singapore’s city centre, SENTOSA is a home to an exciting array of themed attractions, award-winning spa retreats and resort accomodation, alongside lush rainforests, golden sandy beaches and luxury residences. 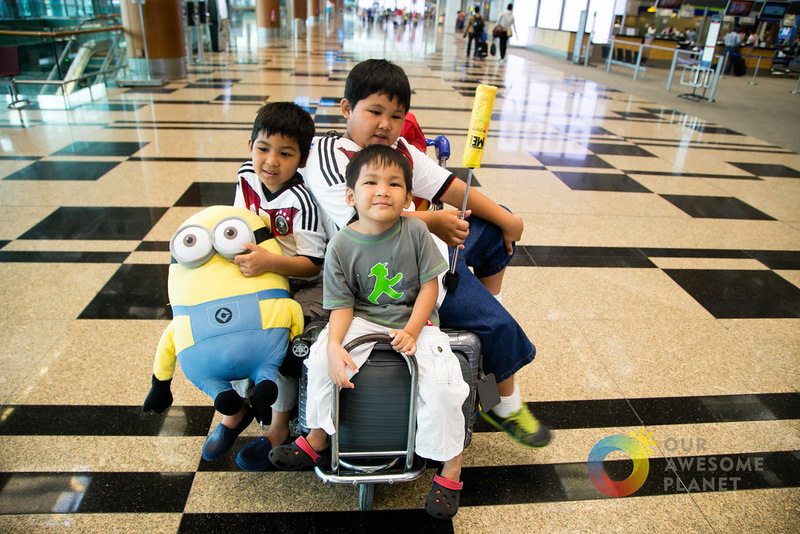 I recently got stuck in Singapore with my 3 boys, and that’s where I discovered Changi Recommends, who helped us with our last minute hotel booking. Having data connection is crucial when you travel abroad, especially during times like this. I learned that Changi Recommends offers the best mobile data rate at S$10/day ( ~P350/day) when you travel to Singapore, which is better than local telco data roaming rates. One of the most recommended places to eat in Little India is The Banana Leaf Apolo. It’s like a turo-turo Indian fast food joint but with a resto format. It’s the perfect lunch spot after the long and appetizing LITTLE INDIA WALK: Dhobis, Saris & a Spot of Curry. Dhobis, Saris and a Spot of Curry™ A Little India Walk is a a 3.5+-hour heritage walking tour of Singapore’s Little India, created by Journeys Singapore. If you have not been to India, this is a good tour to join as an introduction to the Indian culture and way of life.